Arnwine, Blachura, and I rode The Lot last night well into the darkness. Dave opened his bag off tricks and was throwing down everything off the drop. 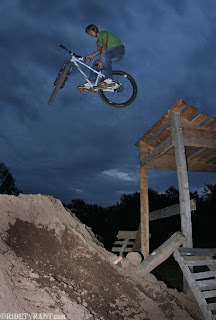 We carved out 2 smaller dirt jumps, which are pretty fun. Trying to add a little variety to The Lot instead of the same old, same old. This weekend should be super fun!! !